The last U.S. combat troops left Vietnam 40 years ago today, and the date holds great meaning for many who fought the war, protested it or otherwise lived it. The last U.S. combat troops left Vietnam 40 years ago Friday, and the date holds great meaning for many who fought the war, protested it or otherwise lived it. While the fall of Saigon two years later is remembered as the final day of the Vietnam War, many had already seen their involvement in the war finished – and their lives altered – by March 29, 1973. 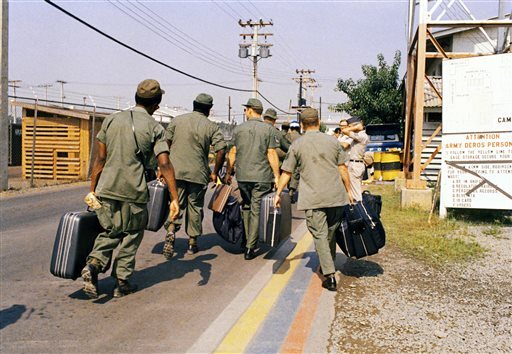 U.S. soldiers leaving the country feared angry protesters at home. North Vietnamese soldiers took heart from their foes’ departure, and South Vietnamese who had helped the Americans feared for the future. Many veterans are encouraged by changes they see. The U.S. has a volunteer military these days, not a draft, and the troops coming home aren’t derided for their service. People know what PTSD stands for, and they’re insisting that the government takes care of soldiers suffering from it and other injuries from Iraq and Afghanistan. Dave Simmons of West Virginia was a corporal in the U.S. Army who came back from Vietnam in the summer of 1970. He said he didn’t have specific memories about the final days of the war because it was something he was trying to put behind him. “We were more interested in getting back, getting settled into the community, getting married and getting jobs,” Simmons said. He said he was proud to serve and would again if asked. But rather than proudly proclaim his service when he returned from Vietnam, the Army ordered him to get into civilian clothes as soon as he arrived in the U.S. The idea was to avoid confrontations with protestors. “When we landed, they told us to get some civilian clothes, which you had to realize we didn’t have, so we had to go in airport gift shops and buy what we could find,” Simmons said. Simmons noted that when the troops return today, they are often greeted with great fanfare in their local communities, and he’s glad to see it. “I think that’s what the general public has learned – not to treat our troops the way they treated us,” Simmons said. Simmons is now helping organize a Vietnam Veterans Recognition Day in Charleston that will take place Saturday. As Lam, now 76, watched American forces dwindle and then disappear, he felt a rising panic. His close association with the Americans was well-known and he needed to get out – and get his family out – or risk being tagged as a spy and thrown into a Communist prison. He watched as South Vietnamese commanders fled, leaving whole battalions without a leader. “We had no chance of surviving under the Communist invasion there. We were very much worried about the safety of our family, the safety of other people,” he said this week from his adopted home in Westminster, Calif. But Lam wouldn’t leave for nearly two more years after the last U.S. combat troops, driven to stay by his love of his country and his belief that Vietnam and its economy would recover. Now, Lam lives in Southern California’s Little Saigon, the largest concentration of Vietnamese outside of Vietnam. Looking back over four decades, Lam says he doesn’t regret being forced out of his country and forging a new, American, life. “I went from being an industrialist to pumping gas at a service station,” said Lam, who now works as a consultant and owns a Lee’s Sandwich franchise, a well-known Vietnamese chain. Wayne Reynolds’ nightmares got worse this week with the approach of the anniversary of the U.S. troop withdrawal. “I saw a lot of people die,” Reynolds said. Today, Reynolds lives in Athens, Ala., after a career that included stints as a public school superintendent and, most recently, a registered nurse. He is serving his 13th year as the Alabama president of the Vietnam Veterans of America, and he also has served on the group’s national board as treasurer. Like many who came home from the war, Reynolds is haunted by the fact he survived Vietnam when thousands more didn’t. Encountering war protesters after returning home made the readjustment to civilian life more difficult. Reynolds said the lingering survivor’s guilt and the rude reception back home are the main reasons he spends much of his time now working with veteran’s groups to help others obtain medical benefits. He also acts as an advocate on veterans’ issues, a role that landed him a spot on the program at a 40th anniversary ceremony planned for Friday in Huntsville, Ala. It took a long time for Reynolds to acknowledge his past, though. For years after the war, Reynolds said, he didn’t include his Vietnam service on his resume and rarely discussed it with anyone. “A lot of that I blocked out of my memory. I almost never talk about my Vietnam experience other than to say, ‘I was there,’ even to my family,” he said. 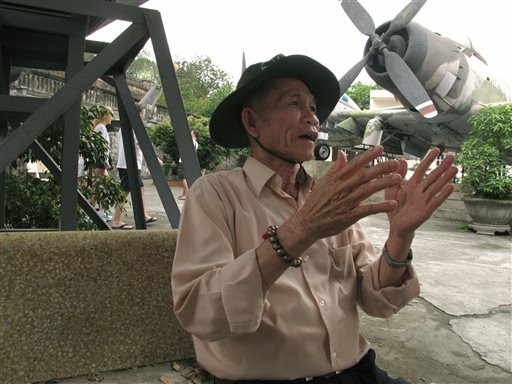 “The news of the withdrawal gave us more strength to fight,” Minh said Thursday, after touring a museum in the capital, Hanoi, devoted to the Vietnamese victory and home to captured American tanks and destroyed aircraft. 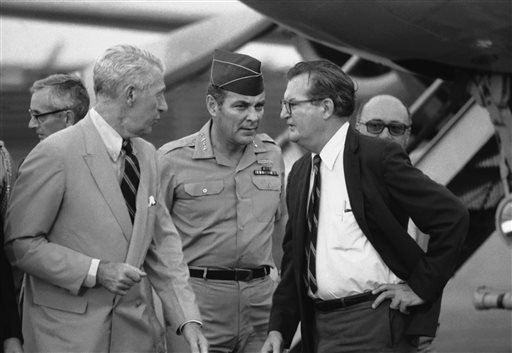 “The U.S. left behind a weak South Vietnam army. Our spirits was so high and we all believed that Saigon would be liberated soon,” he said. The past 40 years have proven that free enterprise is the key to prosperity, Warner said in an interview Thursday at a coffee shop near his home in Rohrersville, Md., about 60 miles from Washington. He said American ideals ultimately prevailed, even if the methods weren’t as effective as they could have been. Chief Warrant Officer 5 Duane Johnson, who served in Afghanistan and is a full-time logistics and ordnance specialist with the South Carolina National Guard, said many Vietnam veterans became his mentors when he donned a uniform 35 years ago. “I often took the time, when I heard that they served in Vietnam, to thank them for their service. And I remember them telling me that was the first time anyone said that to them,” said Johnson, of Gaston, S.C.
“My biggest wish is that those veterans could have gotten a better welcome home,” the 56-year-old said Thursday. Johnson said he’s taken aback by the outpouring of support expressed for military members today, compared to those who served in Vietnam. John Sinclair said he felt “great relief” when he heard about the U.S. troop pull-out. Protesting the war was a passion for the counter-culture figure who inspired the John Lennon song, “John Sinclair.” The Michigan native drew a 10-year prison sentence after a small-time pot bust but was released after 2 ½ years – a few days after Lennon, Stevie Wonder and others performed at a 1971 concert to free him. “There wasn’t any truth about Vietnam – from the very beginning,” said Sinclair by phone from New Orleans, where he spends time when he isn’t in Detroit or his home base of Amsterdam. The Vietnam War also shaped the life of retired Vermont businessman John Snell, 64, by helping to instill a lifetime commitment to anti-war activism. He is now a regular at a weekly anti-war protest in front of the Montpelier federal building that has been going on since long before the start of the wars in Afghanistan and Iraq. 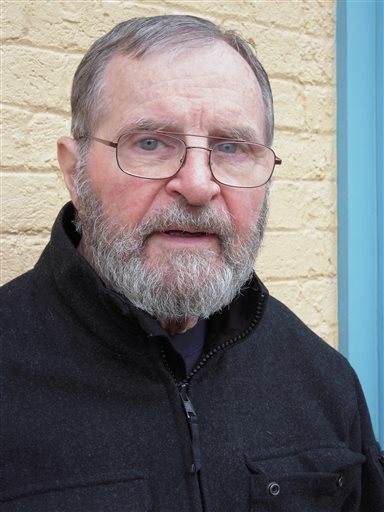 The Haslett, Mich., native graduated from high school in 1966 and later received conscientious objector status. He never had to do the required alternative service because a foot deformity led him to being listed as unfit to serve. “They were pretty formative times in our lives and we saw incredible damage being done, it was the first war to really show up on television. I remember looking in the newspaper and seeing the names of people I went to school with as being dead and injured every single week,” said Snell, who attended Michigan State University before moving to Vermont in 1977.